This letter simply informs Mrs. Hammond that a parcel, containing a new print of film, has been sent out on the day of this letter's writing and will reach her on Monday. 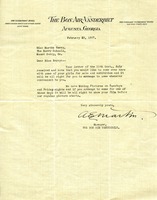 A. E. Martin replies to Miss Berry's letter and writes that she may show her film on a Tuesday or Friday before the regular show whenever is convenient for her. Frank Campsall, assistant secretary to Henry Ford, writes to inform Martha Berry that her letter to Mr. Ebling has been referred to him and that he will send a number of still pictures and two reels of film from the SIlver Anniversary of Berry. He also suggests that she make notes of titling for the scenes in the film and return it so that they might make any changes before returning it to her.